A few weeks ago, I enjoyed a late night dinner with some out old college friends up for the weekend. The original plan was dinner at Buttermilk Channel, which I STILL embarrassingly enough have not been to. It was a group of 7, so a reservation a week in advance still left us with a 9:30pm seating. Sadly things changed. My friends who planned to stay in Brooklyn were bumped last-minute and moved to Manhattan, as if it was no big deal. Maybe I’m crazy but if you book a specific hotel in Brooklyn, you probably have a reason to do so. After work drinks moved to midtown, as did our dinner reservation. I had been to Craft and Colicchio & Sons before; both offered stunning meals. I had complete confidence in Tom Colicchio’s work so when I found a 10pm dinner reservation at Craftbar (thank you Open Table app! ), I snagged it, knowing there would be something there for everyone. What I love about dining in New York in general is that meals revolve around your own personal schedule. A few years ago we went to a game restaurant outside Colorado Springs. We made a 8pm reservation (not the latest available) and were practically pushed out of the restaurant as we finished up around 9:30pm. Literally, they turned the lights out at the restaurant after we walked out. 8pm is a standard dinner time for me, and while I understand some places prefer earlier meals, don’t allow later reservations if you don’t want to serve people. When we walked into Craftbar, the restaurant was as animated as it might have been around 7pm. A late dinner was nothing out of the ordinary and even taking our time, finishing up well after midnight, our party wasn’t the only one to close the restaurant. The ambiance at Craftbar is not quite as rustic and homey as Craft itself. It feels more modern and trendy. But close your eyes as your savor your first bite and I guarantee you won’t notice the difference. 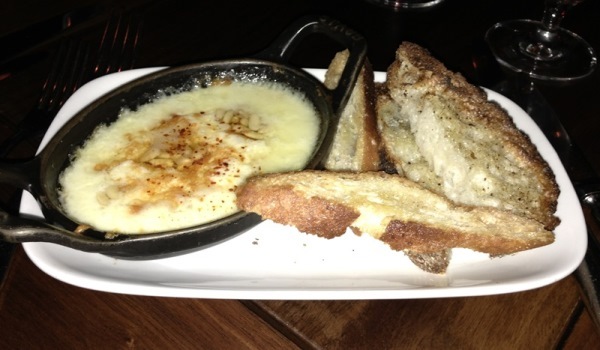 Dinner for me started with a Pecorino Fonduta. I had no idea what I was getting into but found the word “fondue” staring back at me. If it’s cheesy, I’m in love. The Fonduta was accented by warm honey and toasted pine nuts. It was my very own personal fondue. So good, that I had difficulty sharing when my other friends jealously looked on. I shared (a bite) with my husband, of course, because I think it’s actually mandated somewhere in the marriage vows. The accompanying crostini was crisp but a few pieces too little. While additional crostini eventually made its way to the table, I was just as content to use my spoon and savor the last bits like a rich cheesy soup. Next came the scallops. Deeply caramelized and perfectly seared. They were served on a bed of earthy mushrooms and a tart red cabbage chutney. Generally cabbage is one of my least favorite vegetables, but the way this was seasoned, I couldn’t get enough. The balance of cabbage, spice and acid was just perfect. I’m always one for dessert, but that night I had no desire. Not that the dessert menu didn’t look fantastic, or that I was too full. My savory meal was so perfect, I didn’t want anything to take away from it. For my next meal I fully plan on indulging, but this time a two course meal was perfectly satisfying. 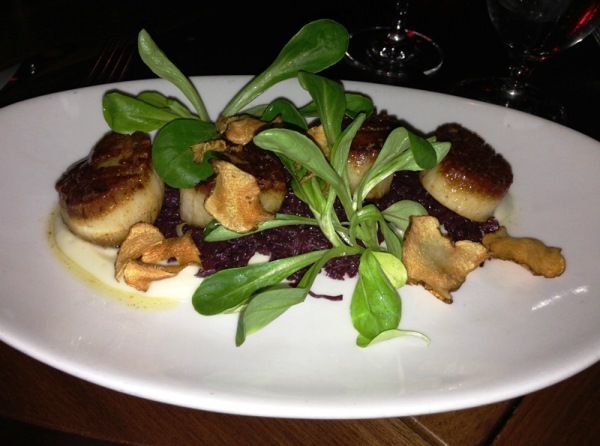 Craftbar, like many of my favorite restaurants focuses on high quality seasonal ingredients. Even looking at the menu today, it varies from what sat in front of me just a few weeks before, with the exception of some classic standards. My foodie friends might have been jealous of my Pecorino Fonduta, but it was me that enviously looked on as my friend devoured every bite of her Buttermilk Fried Young Chicken. Maybe next time I should consider sharing more often. Yum, I love Craft and I agree Tom Collichio knows what he is doing. Your meal sounds amazing. Great review! Thanks! I don’t consider myself a follower of chefs, but you’re right, when you’ve found someone who does everything right, how can you stay away? !